It's fun to get your hands messy mixing the herb and lemon marinade - rustic-style - with your fingertips before barbecuing this easy and delicious Grilled Chicken for dinner! My favorite way to mix a marinade for grilled meat is to combine the ingredients directly on my cutting board. It's something I saw Jamie Oliver do on one of his cooking shows. You begin by drizzling olive oil (or a sauce) on your cutting board. Then you build the marinade's flavors by sprinkling on herbs, spices and other fixings you think would go well with the flavors you have chosen. The fun continues when you get to blend the ingredients together with your fingertips! No bowls, no measuring spoons, and no mixing spoons. It’s all very rustic – which I love! 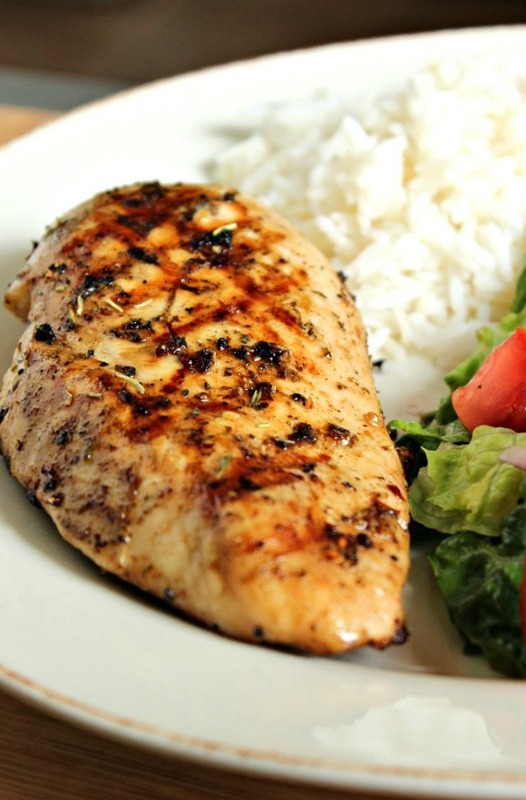 It's how I came up with this tasty chicken marinade recipe. 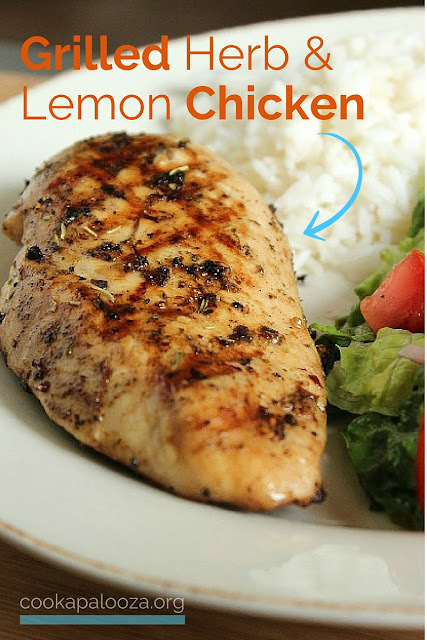 The extra virgin olive oil helps keep the chicken breast moist as it cooks on the grill, and the herbes de provence spice blend with the splash of fresh lemon juice adds plenty of flavor! I didn't measure the ingredients, so I guessed on the amounts when I wrote the recipe below - they are probably fairly close. 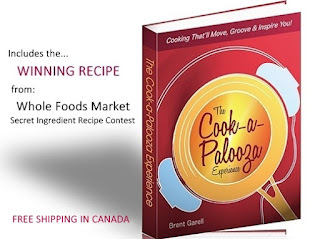 The Eight Summer Salad Recipes you receive from The Cook-a-Palooza Experience cookbook, when you subscribe, are much more interesting than the chopped salad I served with this marinated grilled chicken breast. 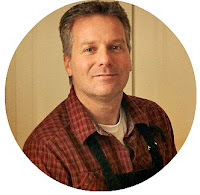 Every Sunday I keep subscribers posted about new recipes I have tried (and liked) or ones I've posted here on the blog. 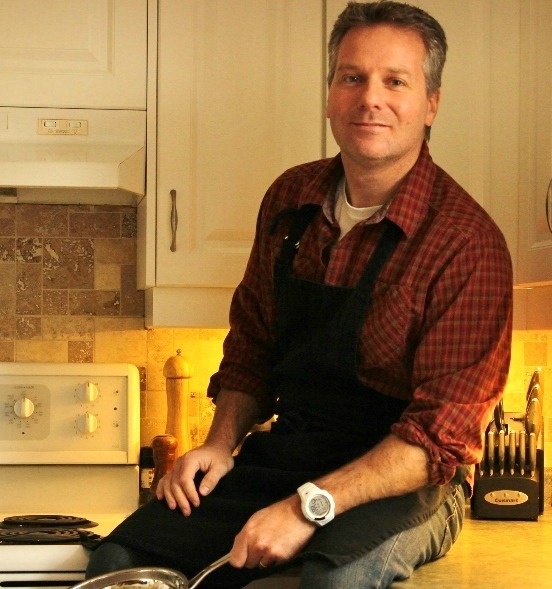 I also pass along cooking techniques to ensure you enjoy what you eat rather than wonder what went wrong. The updates are free, signing up is easy, and you can unsubscribe at any time - with no hard feeling. Click here to get started. 1. 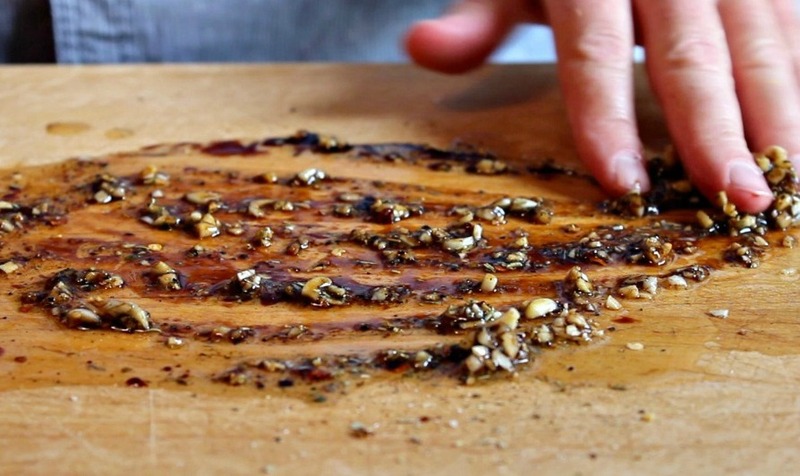 Drizzle olive oil on a cutting board. Add garlic, herbs, soy sauce and red pepper flakes. Mix together with your fingertips. 2. Pat chicken breasts dry with a paper towel. Place chicken on the cutting board and rub all sides with the marinade mixture. Drizzle each chicken breast with fresh lemon juice. Let sit at room temperature for 10 minutes. 3. Heat grill over medium-high heat. Cook chicken until it is no longer pink in the middle, about 6 to 8 minutes per side. 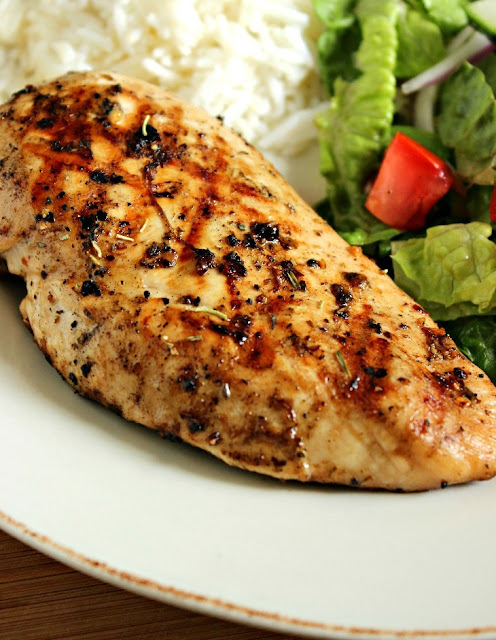 Let cooked chicken breasts rest for five minutes before slicing – this allows all the flavorful juices inside to redistribute throughout the chicken breast instead of spilling out on the plate. Enjoy!